Retained by IMC and Tsao McKown for Retail Tenant concepts for a MXD in Quindao China. Advised on configuration and operational issues for Five-Story Re- tail Atrium; Created Tenant Mix with Anchor, Lifestyle Retail, Cafes, and Business SkyLounge. With E&Y Moscow, for underground Mall adjacent Red Sq., our scheme based on US/Euro practices identified $400 Million cost reduction for a Joint-Stock Company. 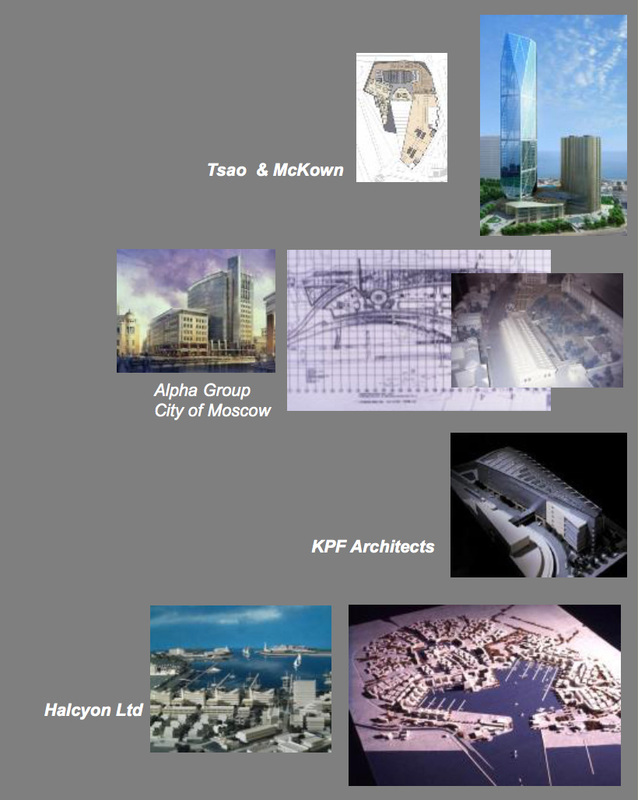 With Alpha Bank created Arbat Office MXD concept for Internationals, with Layouts and Financing Scenarios. With E&Y for Hong Kong Land, created illustrated Concept of high-tech concourse to Transit and Convention Center, featuring Innovative Retail Service concepts, interactive Media, and reinterpretation of a traditional Singaporean "Street of Cafe's." Halcyon's Master Plan for Algarve Coast New Town illustrated Cruiseship Port-of-call and high Density Resort Residential / Hotels / Cafes facing a new Harbor Marina. Modular Vaulted Townhomes created Seasonal Neighborhoods with pedestrian pathways to the Harbor.